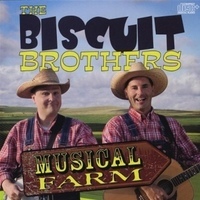 The Biscuit Brothers is a half-hour Emmy-award winning television program produced in Austin, Texas. It first went on the air in Austin, Texas in 2004 and then premiered nationwide in 2005. The show uses a mixture of live-action, puppetry, and animation to teach music and cultural communication through music to 3-7 year-olds and their families. The project was created and is produced by Allen Robertson, Jerome Schoolar, and Damon Brown. The show features include "The Instrument of the Day", "Crazy Classics", and has songs that everyone can sing along with. The show is presented by KLRU, a PBS member station in Austin, and in addition to airing there (as of January 2006) the program is airing on Texas PBS stations in Houston, San Antonio, Corpus Christi, Waco, Temple, Lubbock, and the Rio Grande Valley. Nationally (as of 2008) the show airs on PBS stations in North Carolina, New York state, Oklahoma, Florida, Utah, Michigan, Louisiana, Pennsylvania, Indiana, Georgia, Alabama and California. The Biscuit Brothers have performed live in hundreds of venues across Texas as well - most notably at the Austin City Limits Music Festival (ACL Fest) in 2004, 2005, and 2006. The television program is in its fourth season of production (premiering early 2009) airing on PBS stations across the nation. It currently stars Allen Robertson "Buford Biscuit" (also Music Director), Jerome Schoolar "Dusty Biscuit" (also Producer), Jill Leberknight "Buttermilk Biscuit" (also the Field Producer), Damon Brown "Tiny Scarecrow" (also Director), and Ian Scott "Old MacDonald". Music icon Willie Nelson also contributed voice talent to the program and the show often features numerous Austin musicians, nationally recognized United States performers, as well as internationally recognized artists such as Evelyn Glennie. The show is shot at Pioneer Farms in Austin, and the theater scenes are shot at the Scottish Rite Theater in Austin.